As a sport in Texas, stand up paddle boarding started with the very first race called the “SUP Jam,” which took place in Austin in 2010. In 2011 the SUP Jam invited professional paddler, EJ Johnson, who came into town and completely dominated the field in the Elite 6 mile- Texas had some catching up to do. Since then Texas has been flooded by events from Dallas to Galveston and races like the SUP Cup and Waterman’s Paddle for Humanity. In 2014 approximately 120,000 Texans got on a paddleboard at least once and out of this large number of people a small percentage of paddlers, approximately 500 (less than 1%), competed in at least one paddleboard race. Out of the 1%ers is a core, elite group of paddlers who continue to grow the sport and push their abilities as athletes in the local racing scene and beyond. These are some of your Texas’ Top Paddlers. Joe Cerdas– Over the past three years Joe has been Texas top SUP athlete and leading contender to put Texas on the map in the professional paddle racing scene. Galveston Island local and hometown life guard, Joe is also a new KM Board team rider, SUP Gladiator Team Captain and competitor for the Costa Rican National Team at this year’s ISA World Championships. Noteable races include a 36th finish at the Battle of Paddle Elite race in 2014. He is the 2015 Texas Paddle Racing Series Champ (TPRS). Today he is building up the next biggest team in Texas paddle racing via his local company called- Ocean Tribe. Tyler Marshall– Reigning WPA Champ for Region 12, DFW Surf founder, Boarders Magazine editor and Yolo Board team rider, Tyler has been one of the leading pioneers for paddleboarding throughout Texas since day one. Like Joe, Tyler has had the opportunity to compete with the “big boys” and notable race finishes include two second place finishes in class at two of the biggest races in the nation- Lake Tahoe Race the Lake and Hano Hano Huki in San Diego and a 4th place finish at last year’s 2014 WPA Championships in Florida. Nate Richard– Reigning WPA Champ for 14 foot board class and a SUP Gladiator team rider, Nate is passionate about taking racing to the next level. Noteable races include 1st place at the 2014 SUP Cup and 5th overall at the Big River Regional. 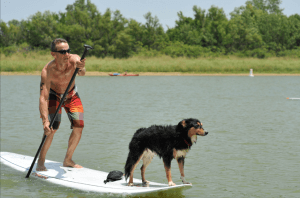 He lives and trains on Lake Grapevine in North Texas where he founded a paddle fitness company called Lake Set Fitness. Peter Ching– Year after year Peter is in attendance of at least 75% of Texas races. A very dominant paddler, #1 in Texas for ages 40+ and still able to edge out his younger competitors (2nd overall at this year’s Bambu Bash). Peter rocks a very speedy 25 inch wide Infinity race board and he lives and trains on Lake Austin. Just behind Peter in class is Hawaiian native, team DFW Surf athlete, Don Anderson, an original Texas competitor and several 1st place finishes throughout the years. Other big names on the mens side include Galveston local, Travis Dhonau, Ben Baecker of Waterside Sports, Chris Tietz from Austin, Cody Forgy from Grapevine, Joe Joe Cunningham of Turtle Island SUP and former competitive paddlers who attend a race from time to time- Buck Ashcraft (1st place at SUP Jam 2008) and Jared Matthews (2nd place at Galveston Island Paddle 2013). Other pioneer paddlers and top unlimited class competitors include Casey Gotcher with SUP Gladiator and Ryan “Slim” Stevens of Austin Paddle Sports. Lee Harle, founder of the SUP Cup is another notable athlete/pioneer from Austin/Bastrop area and Travis Daoust a strong paddler from Fort Worth. Andra Dunn– In only her second year in the SUP racing scene Andra has been determined and dominant, leading the way in the 14 foot women’s division by a mile. She is the 2015 TPRS Champ, also notable for taking second at this year’s Big River Regional. 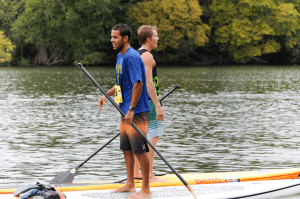 Linda Mccoy– Founder of CenTex SUP, a meetup for paddlers in the Austin area, Linda has continued to push the sport in the right direction year after year. This year she was awarded the REI Community Involvement Award from Keep Austin Beautiful and Female Volunteer of the Year Award for the State of Texas for Keep Texas Beautiful for her outstanding work to keep Texas lakes clean and eco friendly through monthly organized trash clean ups. 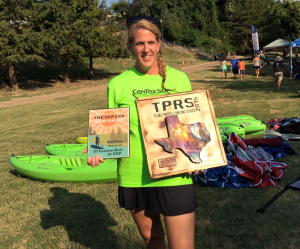 Linda is also one of the top SUP racers and seems to have been at every single race over the past four years, most notable this year for winning the TPRS (Texas Paddle Racing Series) Women’s 14 Foot 5K. Konae Nowell– Like Peter Ching, Konae has been the most dominant paddler for 40+ and consistently # 2 or #3 overall, only 2 minutes behind Hannah in this years Colorado River Ramble 10K. A daily paddler part of the DFW Surf Club in North Texas, Konae is truly blessed to have found paddleboarding. The first moment she stepped on a racing style board she got hooked and has paddled nearly every day since. She has had the opportunity to paddle with industry noteable coaches/athletes like Quickblade’s Jim Terrell and World Champ Candice Appleby to improve her knowledge and enhance her skills. Other women’s noteables include Galveston’s Ellie Cherrihomes, Jenell Vollmer from Austin (Austin Paddleboarder Volunteer of the Year- 2013, 1st places in Corpus SUP Classic, Island Paddle, Rockport’s Oceanfest, Colorado River Ramble and more) and Juliet Urushima, a passionate paddler and pioneer from North Texas and founder of a local company on Lake Lewisville called “The SUP Shack” and other North Texas competitors like Kristen McGregory and Heidi Schewennesen. Another great year at DFW Surf. Good times at the lake, fun memories and friendships that last a lifetime. 2014, in our seventh season, DFW Surf has continued to introduce new people to the watersports that we love and a lakeside lifestyle that lasts into the winter. So many great memories this year it was hard to narrow it down to just 6 photos. 2014 was the year of Team DFW. We our proud of our athletes like Ashley Kidd who won this year’s World Wake Surfing Championship, Parker Payne taking second at National’s in Georgia and Nate Richard and Tyler Marshall who took first in class for WPA Region 12. 1. Sunset Surf with Parker Payne. It was the perfect evening at DFW Surf @ Lake Lewisville and a sunset surf session with the Payne’s. Mark Payne, Parker’s Dad, captured a great shot of Parker surfing into the sunset and boosting big on his pro model Day 1 Wake Payne Killer wake surfboard. 2. A great picture of the fun and exciting SUP action at this year’s SUP Cross Championship at the fifth annual DFW Surf Open and Grape Paddle. And here is one of our newest club members, one of the top amateur figure skaters and up and comer SUP racer, Ms. Kirsten Knowell. If you have not tried SUP Cross then just imagine a tight little race course with multiple turns, bumping, splashing and falling in. Special thanks to Bounce SUP who sponsored the event and everyone had the same advantage. Bounce fell in love with this picture and this will be the featured picture at the upcoming Winter 2015 Surf Expo. 3. As always the annual Big Boat Invitational is one of the highlight events of the year for wake surfers. An opportunity to surf behind one of the biggest man made waves thanks to Captain Michael Wilson’s power yachts and Texas Powerboating. In this picture Todd Johnson is stoked with his hands up on top of the boat to witness four surfers: (in front) Dominic Lagace, Ashley Kidd, Parker Payne and Tyler Marshall quad surfing the lengthy yacht wave. 4. Check out DFW Surf’s Danny Braught in the Centurion Boats spread in the December Lights Issue of Boarders Magazine. Danny looks priceless here with his red curly hair in a photoshoot on Lake Lewisville on the new Centurion FS models. Special thanks to our big sponsors for the year including Freedom Powersports and Centurion Boats. Have you ever wake surfed behind one of these? There is a reason why it is the official towboat of the World Wake Surfing Championship. Get on board for 2015 and see what you’ve been missing. 5. What a great event at this years Little Elm paddle board WPA race on Lake Lewisville and DFW Surf founder Tyler Marshall taking second in class and making it to the finals here of the sprint races. Think you can paddle fast? Think again. Try racing against some of these guys like Infinity racer’s Sean P (center right). 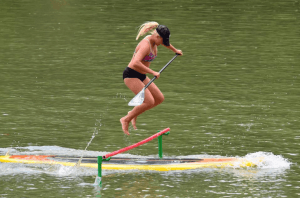 This really marked the first year of international competition within the Texas SUP racing scene and it was a significant moment for the short lived sport and international sup racers who are making their travel plans to Texas in 2015. 6. DFW Surf Club member Konae Knowell with Olympic athlete and QuickBlade Paddles founder Jim Terrell. It is exciting to see the influence we have had upon some of our customers at DFW Surf including second year club member, Konae Knowell, who has grown to become one of the top SUP racer athletes in Region 12. Konae is so into the sport that she contacted Jim here and set up a private lesson with the mad scientist. Read the full story at boardersmag.com. 7. The Dallas Stars girls rocking Bounce Boards at the fifth annual DFW Surf Open and Grape Paddle (headlining picture at top of page). It was great to have Dallas Stars Ice Girls come out to DFW Surf @ Lake Grapevine and try paddleboarding and paddle board, or SUP Yoga, for the first time. For 2015 we will look to book other local professional organizations for team building and corporate events like this one. Special thanks to Jen Bodnar and Magen Berry for their help here with SUP Yoga for this team building exercise. 1. Oscar Aguillar wake surfing with his daughter on Lake Grapevine. Classic hang loose shot. Thanks again to Oscar for his support; he has three kids and is getting all of them involved in wake surfing at an early age. 3. DFW Surf Kick Ball team representing their hometown local surf company in the City of Grapevine quarterly kickball league at Dove Field. All though we did not take the victory this year, we had a lot of fun kicking some grass. Great year, thanks again to all of our fans. See you on the water in 2015! Take a look at the rest of the 2014: Best of Pictures on our DFW SURF facebook page. Get on Board!